Hello! Can you believe I'm getting a post out in the morning? Me neither! Today I am showing you a new technique for me. 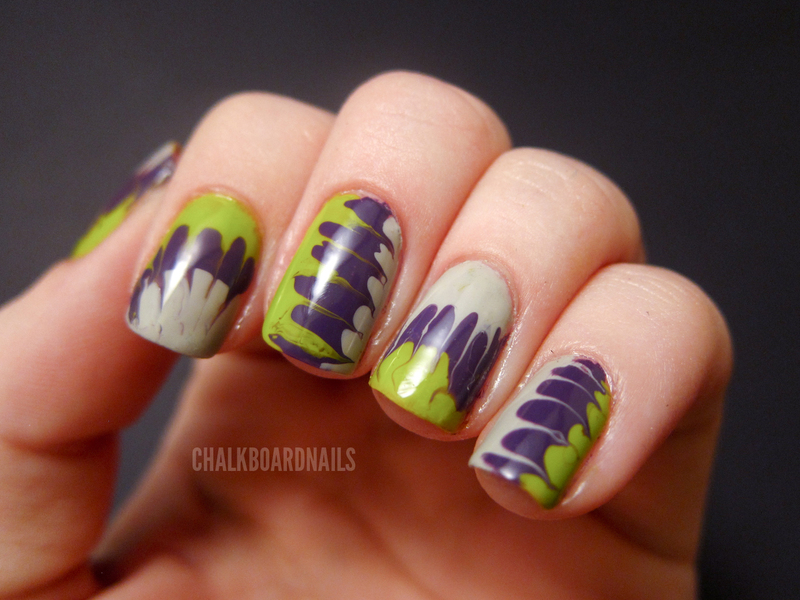 It's called needle marbling or needle dragging, and it is harder than it looks! I used this YouTube tutorial for instruction, but it does take a lot of trial and error to get it down. Liquid Jelly also has a different type of needle marble tutorial that you should check out as well. Of course, I had to make it Halloween appropriate! So basically this involves putting on really thick layers of polish in stripes, and then dragging a needle lightly through them to create this tie-dye effect. Seems easy, right? Well, I had some troubles, including bald spots, colors that wouldn't drag, flooded cuticles, wobbly lines... it goes on. But I'm pretty pleased with the effect, overall! I used OPI Skull and Glossbones, OPI Funky Dunkey, and OPI Who the Shrek Are You. I am really getting a lot of mileage out of these Shrek polishes, aren't I? I think I would do a better job with this if I were to try it again. I think this is truly a "practice makes perfect" technique. Have you guys tried this before, and for those of you who have, did you have an easier time with this method? Love it! You'd never know you had any issues with it- the effect is purple, and I love the colors you chose to represent Halloween! Ohh I need to try this!! awesome!! you know my trouble with it. i plan to retry. Love your design! This looks fantastic! I've never seen this technique before but I'm going to have to try it! Thank you all! :D Let me know if you give this method a try so I can check it out! Awesome mani!! I must try this! OMG! Wow! These are great! LOVE LOVE LOVE the colors! @Alyssa, I think you had better luck with this than I did, yours look great! I only tried it once with a tooth pick but I got annoyed at all the bald spots so I didn't complete it. This is a really cool idea! I may not be loving the color combo-but the technique is a cool one! These colors together are killer. @7bridges - OMG that is an amazing idea. THANK YOU! !